Read on to find out how to style round glasses in this article that is Suitable for Malaysians aged 16 to 36. No doubt we love to love the vintage style. Everything vintage seems to be making a comeback in the world of fashion nowadays. There is no exception to the oh-so-versatile round glasses, which typically suits just about anyone with any style. Think about Harry Potter, do you think every glasses can rock in both the wizarding world AND the modern day muggle world? I guess not. As versatile as round spectacles are, here are some of our favourite ways to style the timeless piece. Show your sophisticated business side with an oversized black round sunglasses, as black is always classy, always. For a pop of colour, pair the glasses with a coloured blazer. Go for colours like navy blue, grey, burgundy, or like Korean pop star Suzy pictured above, match with ocean blue blazer with a cream top underneath. However, don’t feel restricted, as black glasses go well with anything. If black is not your thing, tortoise shell delivers sophistication just as much as black glasses. Tortoise shell glasses instantly add a splash of colour to the otherwise boring black and white business outfits. Just be sure to go for the more subtle and darker variety of tortoise shell for a more polished, classy look. Trust me when I say round glasses are great for casual wear. Just about any type of round glasses add sugar and spice to your everyday look. Some of our favourites are thin framed round glasses for that minimalistic look. 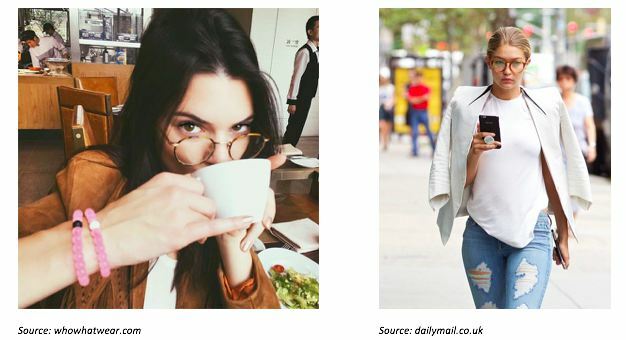 Celebrity fashion: Check out Kendall Jenner sipping coffee while looking good on a casual day out. On the other hand, her fellow model friend Gigi Hadid also casually cruising down the street with a more funky looking thick plastic round glasses and circle frame. There really are no limits of styling with casual wear. Style with anything from leather jacket like what Kendall is wearing, or Gigi’s white blazer placed stylishly over the shoulders. Even if you are just wearing tee and shorts, the right glasses will always enhance your look. Who can forget Jeon Ji Hyun in “My Love from the Star”? Celebrity Fashion: Her character in it is the epitome of glamorous. Like pictured above, go for oversized circle glasses with a pop of colour or pattern to be oh-so-glamorous while still showing a little bit of fun side. Complete your glamour look by styling in preppy clothes: lace dresses, long maxi dresses, an oversized coat, or a tight little black dress. Metal frame and colour tinted lenses, the once dreaded hippie fashion is making a comeback. You can easily spot hundreds of people wearing one of these colourful rounded glasses every year in festivals like the infamous Coachella. To complement its colourful lenses, style with bohemian inspired dresses, crop tops, floral, and laces. Plastic frame with patterns such as tortoise shell works well for the hippie image too. 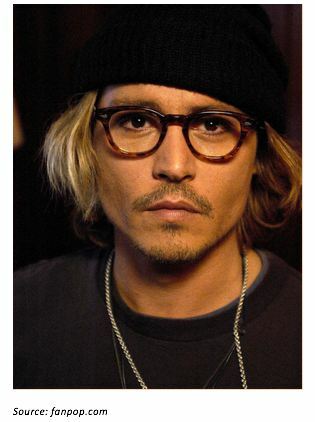 Celebrity Fashion: Like Johnny Depp pictured above, style with rugged clothes, a beanie, and long necklaces. Other choices are like a loose fit flannel shirt and jeans. Round spectacles and circle frame are fun and cheeky which not only serve their designated purpose as an eyewear, but also acts as an versatile accessory to add an extra edge to your daily look. Whichever style of round glasses you choose, remember to keep your personal style in mind, as finding the right pair of glasses can be a tricky business. With the right glasses that complement your style, you can easily look like a fashionista every day! 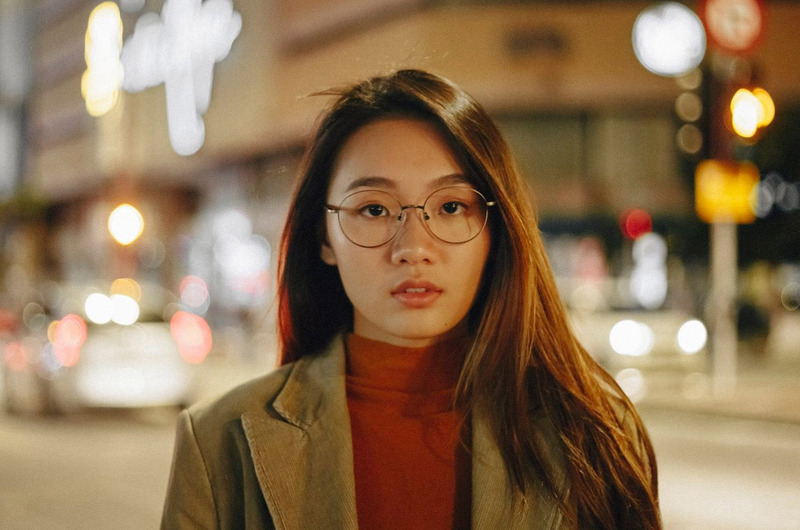 This entry was posted in Eyewear Talk, How to and tagged circle frame, circle glasses, round glasses, round specs frame, round spectacles, round spectacles malaysia.